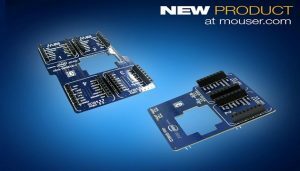 Engineers can now add up to four MikroElektronika click boards to Intel Joule Expansion Board for Internet of Things (IoT) and smart device applications, with the new Intel Joule click shields from MikroElektronika, available at Mouser. The MikroElektronika Intel Joule click shields, aid in extending the functionality of the Intel Joule Expansion Board, which provides easy access to the inputs and outputs (IO) of the Intel Joule system-on-module (SoM). The shields add MikroBUS Adapter click board connectivity to the Intel Joule Expansion Board, enabling engineers to choose from the more than 270 click boards to add displays, radio frequency (RF) connectivity (including Wi-Fi, ZigBee or Bluetooth transceivers), Ethernet modules, or sensors when designing applications such as robots, drones, and IoT devices. The click boards come equipped with examples written in MikroElektronika compilers, which provide a foundation for future IoT design projects. The MIKROE-2546 shield includes two MikroBUS sockets, while the MIKROE-2582 shield includes four MikroBUS sockets. Both shields feature a 12-bit analog-to-digital converter (ADC) with an SPI serial interface and are built on two 40-pin headers that connect to the Intel Joule Expansion Board. To learn more, visit http://www.mouser.com/new/mikroelektronika/mikroelektronika-intel-joule-click-shield/.